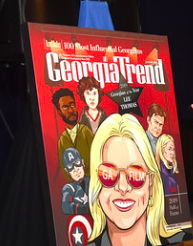 Georgia Trend celebrated the 2019 Georgian of the Year and Most Influential Georgians at its annual awards luncheon, held in the Oceans Ballroom of the Georgia Aquarium. Sponsored by the Georgia Chamber and Fidelity Bank, the event was a festive reminder of the power of hard work, cooperation and collaboration among individuals representing public and private organizations. Former Gov. Nathan Deal introduced Georgian of the Year Lee Thomas, deputy commissioner of the Georgia Film, Music and Digital Entertainment office. His heartfelt address honored her diligence and perseverance in transforming the state’s once-fledgling movie and TV production industry into a juggernaut that had a $9.5-billion impact in 2017. See photos and more at Georgia Trend.